Many runners love and use treadmills, but that doesn’t mean they are affordable. As these exercise machines grow more advanced and technical, prices go up. With this in mind, it’s important to identify some quality, inexpensive options for the runner on a budget. 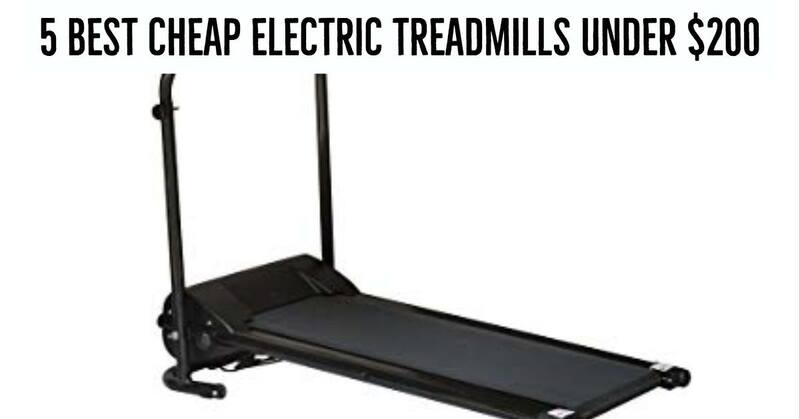 These would be the best 5 cheap electric treadmills under $200. We break them down into categories: Best Value, Most Bells & Whistles, Very Basic & Best Overall. 4 Best Cheap Electric Treadmills under 200 dollars. This is the least expensive treadmill most people can find, costing right around $100 and weighing in at 35 lbs. The full product dimensions are roughly 14.6 x 21 x 45 in. and the machine is capable of holding a maximum of 33 lbs. There is a basic safety key and an LED display that shows important information like calories burned, track speed, and time spent walking or running. The Fitnessclub treadmill includes flywheels for easy movement and maneuverability. The product does not require any electricity and doesn’t have a motor. Instead, the belt is propelled by the user’s natural movement. The treadmill does fold, is height adjustable, and the ramp can be shifted into a climbing position. The belt does take some effort to move. 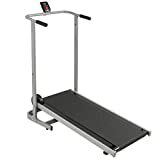 In general, this is a great treadmill for somebody who doesn’t want any frills, doesn’t want to waste any electricity, and instead focuses on getting an inexpensive, quick workout. This treadmill, made by Best Choice products, is another manual folding treadmill designed to be propelled by the body’s natural movement. It costs roughly $120 and runs without an electric outlet or a motor. It weighs around 44 lbs. and possesses full product dimensions of 44 x 22.5 x 45 in. There is an LCD monitor which displays important information like calories burned, speed of movement, and the duration of the workout. The screen does require two AA batteries to function. The treadmill can hold a person who weighs a maximum of 250 lbs. There are wheels so the treadmill can be moved around a room. In general, it is comfortable and simple to use without breaking the bank, making it a popular option. The Confidence Fitness Power Plus Electric Treadmill just barely makes the price limit, coming it at $200 exactly. 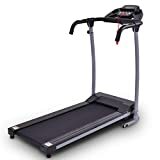 This device comes in black or white, has a multi-function LED display where users can log their runs and record information like calories burned, and folds like almost every other electric treadmill in this price range. The Confidence Fitness treadmill holds users that weigh up to 250 lbs. and has a belt that measures 38.5" x 14" in. The entire machine weighs roughly 53 lbs. and includes wheels. Like most treadmills, there is a safety key so the runner can stop the device when in danger or uncomfortable. There are no cup holders and no place for a cellphone or another device. 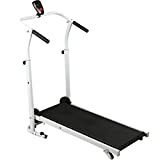 In general, it is a small treadmill but is capable of holding more weight than other variations in the same price range. The final electric treadmill is another folding model made by Goplus. This machine costs roughly $170 and includes most standard features like LED lights, handrails, and a safety key. There are wheels so the treadmill can be moved around as needed, and the folding allows for easy storage. The belt is a tad narrow, measuring at 39" x 14" in. It’s comfortable and capable to hold up to 220 lbs. without damage. There are cup holders and a spot for cellphones to sit without being damaged. The product comes with a warranty and even comes in numerous colors such as bright pink. 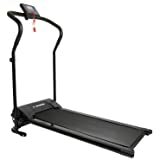 The Goplus Folding Electric Treadmill can be plugged in to most standard outlets and works best for smaller, lighter runners who would like a treadmill for a light to medium exercise routine. When seeking a treadmill under $200, I've found that there are a couple of different options. Runners can choose between a manual or electric machine and can choose either an extremely simple option or one that has a few added comforts like padded handles, cup holders, and even a motor. It's important when talking about treadmills to share the history of them so that when you are comparing them you have a foundational knowledge of how they got to the point we are right now and what makes them different. Treadmills have a strange and complex history. Their original purpose wasn’t actually as exercise machines, but as methods to utilize human energy and punish individuals by making them walk for hours on end for the benefit of someone else. It all started in the late 18th and early 19th centuries, which were exceptionally difficult times to be alive. According to Mental Floss, an engineer named Sir William Cubit developed the original design for the treadmill, calling it a treadwheel. It was to be used in the overcrowded English prisons, where inmates deemed stubborn would be forced to step on the spokes of a large wheel, making it turn. This wheel would crush grain to make flour or push water, which could be harnessed for energy. The tread wheel became popular and quickly spread to the prisons of the United States. The prisoners suffered frequent injuries from their poor diets and constant exercise – imagine a starving individual being forced to use a stair climber for 8-10 hours a day! Eventually, though, the wheel faded out of use by the end of the 19th century, when it was deemed too cruel to be used. But the story of the treadmill did not end there. In the 1960s, Medibank mentions that a physician started to study the tread wheel and developed the prototype of the first treadmill, designed to improve aerobic health. He made a model, slapped a patent on it, and the first treadmill for exercise was born. Nowadays, treadmills are consistent features in gyms. They are, in essence, a moving belt that athletes can run and walk on to simulate normal aerobic exercises without having to move anywhere. 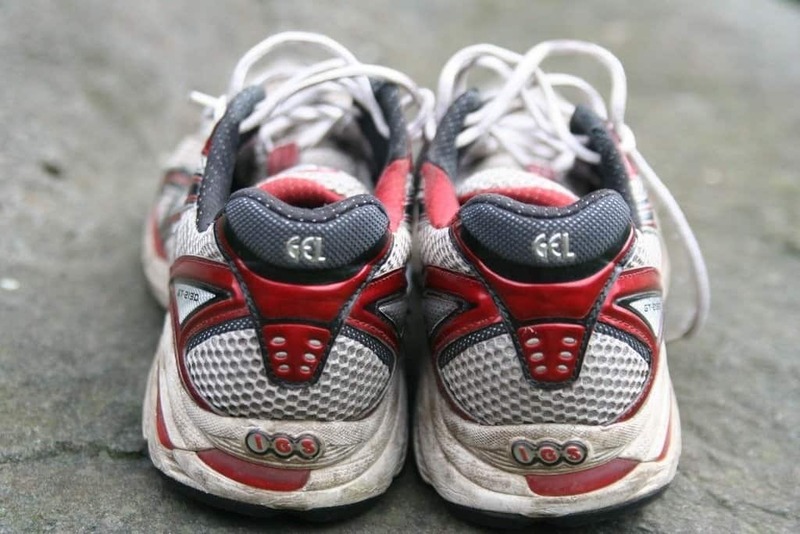 Most individuals use them to run inside when the weather outside is too poor. Considering their popularity, it shouldn’t come as a surprise that treadmills possess a lot of benefits for the average runner. In general, they can improve cardiovascular health, muscle strength, stamina, and the runner’s ability to withstand the force of an impact with the ground. Spine Health mentions they can also improve spinal health and help an athlete build muscle without the need for outdoor exercise. We also share all of the benefits here. However, runners should be careful. Sometimes, the impact of the treadmill can be too much and the athlete can damage their shins and knees. It’s also possible to hurt the muscles in the back when running with bad form, so it’s important that treadmill users make sure they sprinkle in stretching, outdoor running, and other exercises to stay in shape.